Request user permission to access restricted resources by providing a purpose string that explains why you need the access. Modern devices collect and store a wealth of sensitive information about their users. Many apps rely on this kind of data and the device hardware that generates it to do useful work. For example, a navigation app needs the user’s current GPS coordinates to locate the user on a map. But not all apps need access to all data. The same navigation app doesn’t need the user’s health history, camera interface, or Bluetooth peripherals. Your app should access only what it needs to do its job. To support this principle, Apple’s operating systems restrict access to protected data and resources by default. Apps can request access on a case-by-case basis, providing an explanation for why they need access. The user decides whether to grant or deny the request. If the user grants permission, the system remembers the user’s choice and doesn’t prompt again. If the user denies permission, the access attempt that initiated the prompt and any further attempts fail in a resource-specific way. The system automatically generates the prompt’s title, which includes the name of your app. 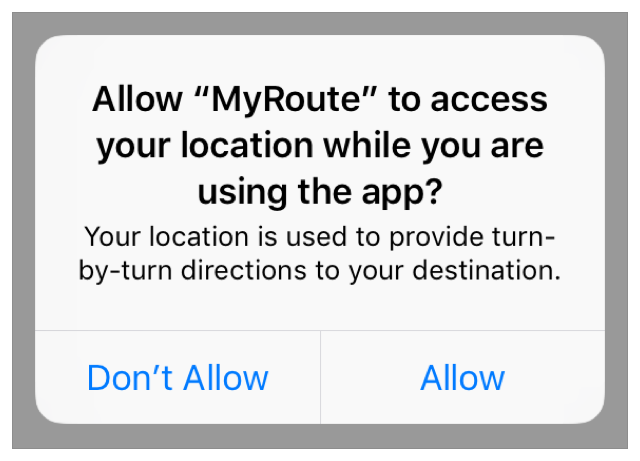 You supply a message called a purpose string or a usage description—in this case, “Your location is used to provide turn-by-turn directions to your destination”—to indicate the reason that your app needs the access. Accurately and concisely explaining to the user why your app needs access to sensitive data, typically in one complete sentence, lets the user make an informed decision and improves the chances that they’ll grant access. Always provide a usage string if your app uses a protected resource. If you don’t, attempts to access the resource fail, and might even cause your app to crash. Many system frameworks that provide access to protected resources have dedicated APIs for checking and requesting authorization to use those resources. This allows you to adjust your app’s behavior depending on the current access it has. For example, if the user denies your app permission to do something, you can remove related elements from your user interface. Because a user can change authorization at any time using Settings, always check the authorization status of a feature before accessing it. In cases without a dedicated API, like HomeKit, be prepared to gracefully handle access failures. When your app attempts to access a protected resource after its first attempt, the system remembers the user’s permission choice and doesn’t prompt again. To prompt the user again, you must reset access to these resources on your device or system. To reset permission acess to a protected resource in iOS apps, tap Settings > General > Reset > Reset Location & Privacy on your device. Using Reset Location & Privacy resets location and privacy settings for all services on your device. This command resets authorization access for all apps using the protected resource. You can similarly specify AddressBook, Calendar, Reminders, or other services to reset them individually. A message that tells the user why the app is requesting the ability to send Apple events. A message that tells the user why the app is requesting the ability to connect to Bluetooth peripherals. Values representing the current authorization state of the peripheral manager. A message that tells the user why the app is requesting access to the user’s calendar data. A message that tells the user why the app is requesting access to the user’s reminders. Request access to a user's calendar data through the event store. A message that tells the user why the app is requesting access to the device’s camera. A message that tells the user why the app is requesting access to the device’s microphone. A message that tells the user why the app is requesting access to the user’s contacts. A message that tells the user why the app is requesting the ability to authenticate with Face ID. Supplement your own authentication scheme with biometric authentication, making it easy for users to access sensitive parts of your app. A message to the user that explains why the app requested permission to read samples from the HealthKit store. A message to the user that explains why the app requested permission to save samples to the HealthKit store. A message to the user that explains why the app requested permission to read clinical records. Set up and configure your HealthKit store. Respect and safeguard your user’s privacy. A message that tells the user why the app is requesting access to the user’s HomeKit configuration data. Declare your app’s intention to use HomeKit, and get permission from the user to access home automation accessories. A message that tells the user why the app is requesting access to the user’s location information. A message that tells the user why the app is requesting access to the user’s location information while the app is running in the foreground. A message that tells the user why the app is requesting access to the user’s location information at all times. A message that tells the user why the app is requesting access to the device’s accelerometer. A message that tells the user why the app is requesting access to the user’s media library. Displays a user interface so that the user can authorize whether your app may view the media library's contents. A message that tells the user why the app is requesting access to the device’s NFC hardware. A message that tells the user why the app is requesting access to the user’s photo library. A message that tells the user why the app is requesting write-only access to the user’s photo library. A message that tells the user why the app is requesting to send user data to Siri. A message that tells the user why the app is requesting to send user data to Apple’s speech recognition servers. Ask the user's permission to perform speech recognition using Apple's servers. A message in macOS that tells the user why the app is requesting to manipulate the system configuration. A message that tells the user why the app is requesting access to the user’s TV provider account. Protect the user’s data in iOS by encrypting it on disk.